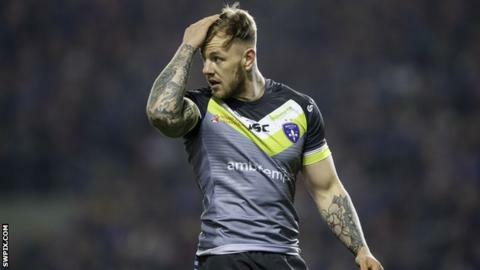 Wakefield winger Tom Johnstone ran in a first-half hat-trick as his side won easily at Leeds in Super League. It ruined a homecoming for the Rhinos, who have played their first four matches away from Headingley while the South Stand redevelopment was finished. Trinity were deserved winners, blowing the hosts away before their break and then mounting a mean defensive effort. For Leeds, the derby defeat was a fourth loss in five games under new head coach David Furner. The Australian will no doubt be concerned at how bad a start his side have made and this was one of their poorest showings yet. There was an extra special feel to the build-up with the new stand open, but Leeds' performance on the pitch did not match the occasion. In fact, late tries from Ash Handley and Tom Briscoe - the second of the evening for both - gave the scoreline a more balanced feel than it warranted. Handley's first score in the opening minutes may have had Rhinos fans thinking this would be a night to remember, but it was soon evident that the visitors were the dominant side. That was largely thanks to Johnstone's finishing - his first after a great sweeping move, his second very similar and his third a classic winger's effort as he plucked a bomb out of the sky. Leeds never recovered and Wakefield - for whom Kyle Wood, Jacob Miller and Danny Brough also crossed - soaked up pressure prior to the Rhinos' consolation double. "We lacked resilience on our try line, particularly in the first half. That caused us some system breakdowns. "We re-assessed at half-time and three or four times they were on our line and we actually stopped them. "We had opportunities to get back into the game but we conceded too many points in the first half." "We've been building something the last two or three weeks and this was pretty special. We scored some great tries. Our left edge was outstanding and Broughy's kicking game was good. "It was important we put in a good performance because Leeds are a good side and it's always a tough place to come. "I was really disappointed with the two tries at the end but, in terms of performance, it was not far off being our best." Leeds: Lolohea; Briscoe, Watkins, Hurrell, Handley; Smith, Myler; Peteru, Dwyer, Merrin, Ferres, Sutcliffe, Cuthbertson. Interchanges: Parcell, Donaldson, Singleton, Oledzki. Interchanges: Horo, Pauli, Kopczak, Hirst.